via Talking With Your Fingers – NYTimes.com. I mostly agree with this idea, that we are all code shifters. I’m less sanguine than, McWhorter, however. His eighth grade sample takes students before they’ve entered a period of schooling where they’d be expected to take on more serious reading and longer and more complex forms of writing. Twitter may not be to blame, but it’s not clear to me the state of writing and reading comprehension at higher levels is doing all that well. There’s some pretty good evidence that it isn’t. So just as a foodie culture may thrive in the midst of a lot of fast food, it’s not clear that we ought to be complacent in the face of an obesity epidemic. In the same way, just because tweeting may not signal the demise of fine writing, it’s not clear that it’s helping the average writer become more facile and sophisticated in language use. This entry was posted in cultural literacy, education, higher education, Humanities, internet culture, literacy, Reading, teaching, writing and tagged composition, John McWhorter, MLA, obesity, Reading, reading comprehension, twitter, writing on May 4, 2012 by Peter Kerry Powers. In the Digital Campus edition of the Chronicle, Gordon Freeman Makes the now common lament that colleges and universities are not taking the kind of advantage of Cloud technology that would enable superior student learning outcomes and more effective and efficient teaching. In doing so he lays blame at the feet of the hierarchical nature of higher Ed in a horizontal world. Higher-education leaders, unlike the cloud-based companies of Silicon Valley, do not easily comprehend the social and commercial transformation gripping the world today. Indeed, there was a certain amount of gloating that the centuries-old higher-education sector survived the dot-com era. After all, textbooks are still in place, as are brick and mortar campuses. The simple fact is that life is becoming more horizontal, while colleges remain hierarchical. We can expect the big shifts in higher education—where the smart use of digitization leads to degrees—to come from other countries. And that’s sad, because the United States makes most of the new technologies that other parts of the world are more cleverly adapting, especially in education. I appreciate the metaphor of hierarchy versus horizontality, and I think it’s seductive, but I wonder if it’s accurate. It captures an American view of the world that images the bad guys as authoritarian and hierarchical and the good guys as democratic and dialogical. Whether or not the horizontal crowd can ever do evil is a post for another day. I’m more interested in whether the slowness of higher Ed to take up new modes of doing business is actually due to hierarchy. Speaking to a colleague at a national liberal arts college that shall not be named, he indicated the president gave strong support for digital innovation in teaching and research, but that the faculty as a whole was slow on the uptake, which meant institution wide change was difficult to achieve. This rings true to me as an administrator. Change is slow not because we are too hierarchical, but because we take horizontality to be an inviolable virtue. Faculty are largely independent operators with a lot of room to implement change or not as they choose. Institution wide changes in educational programming takes not one big decision, but a thousand small acts of persuasion and cajoling in order to effect change. I mostly think this is as it should be. It is the difficult opposite edge of academic freedom. It means that changing the direction of an institution is like changing the direction of an aircraft carrier, and doing so without an admiral who can indicate direction by fiat. There are problems with that, but I’m not sure that the changes required to make higher Ed as nimble as Gordon Freeman desires will result in an educational system we’d like to have. This entry was posted in Digital Humanities, education, higher education, Humanities, internet culture, teaching, technology and tagged academic freedom, Chronicle of Higher Education, colleges and universities, Gordon Freeman, governance on May 1, 2012 by Peter Kerry Powers. Playing Scrabble the other day I looked up the word “selvages” online and in the process discovered the sport of extreme scrap quilting. I still don’t have my mind around the concept since I thought that scrap quilting was by its nature designed to be the opposite of extreme, but apparently it is a “thing” since it calls up 750000 hits on google in one form or another. I can’t quite figure out the difference between extreme scrap quilting and regular scrap quilting, but I’m sure that if its important to my happiness someone will let me know. Or even it’s not. I take it that extreme scrap quilting is on the order of extreme eating, extreme couponing, extreme makeovers, and extreme other things. Indeed, it appears that in order to be noticed as something special and different it is important that it become extreme, unusual, and call attention to itself. I’ve concluded that this is one of the problems with the Humanities. We are not extreme enough. We need to shake off the image of the sedate professors in elbow patches and figure out new ways to make our disciplines sufficiently life threatening to attract interest. If we were more extreme we could have sexier advertisement in college brochures and more positive coverage in the national press. I struggled to come up with a few examples, but I wonder if others could come up with more. “Extreme Hemingway 101”–Read Hemingway on a safari to Africa. You will be injected with a form of gangrene and a rescue plane will fly you in to the side of Mount Kilimanjaro. If you make it out alive your grand prize will be a a year for two in an isolated cabin in Idaho. By the end of this course you will truly understand what it meant to be Ernest Hemingway. Because we will spend so much time flying around the world, we will only have the time for the one short story. But lots and lots and lots of experiential learning. “Extreme Poetry 302”–competitors will rack up debt and be given jobs as baristas. The competitor who is willing to go without health benefits and adequate housing the longest will be rewarded with a publishing contract with 2000.00 subvention fees for the cover art. [Oh, wait….we already do that one for real]. “Extreme Philosophy 479”– an extreme version of Aristotle’s peripatetic school, students will be required to run a marathon on a treadmill while wearing specially designed headsets that allow them to watch all Slavoj Zizek videos currently posted on Youtube [because we realize students are not professional marathoners, we believe there will be sufficient time to actually accomplish this assignment]. Final exam focused on actually reading Zizek is optional. I’m sure there must be other possibilities. I’d love to hear of them. This entry was posted in education, higher education, Humanities, liberal arts, philosophy, poetry, teaching, Uncategorized, writing and tagged Aristotle, baristas, education, extreme sports, Hemingway, higher education, humanities, philosophy, poetry, quilting, Scrabble, Slavoj Zizek on April 30, 2012 by Peter Kerry Powers. Is Twitter Destroying the English language? Coming out of the NITLE seminar on Undergraduate Research in Digital Humanities, my title question was one of the more interesting questions on my mind. Janis Chinn, a student at the University of Pittsburgh, posed this question as a motivation for her research on shifts in linguistic register on Twitter. I’m a recent convert to Twitter and see it as an interesting communication tool, but also an information network aggregator. I don’t really worry about whether twitter is eroding my ability to write traditional academic prose, but then, I’ve inhabited that prose for so long its more the case that I can’t easily adapt to the more restrictive conventions of twitter. And while I do think students are putting twitterisms in their papers, I don’t take this as specifically different than the tendency of students to use speech patterns as the basis for constructing their papers, and not recognizing the different conventions of academic prose. So twitter poses some interesting issues, but not issues that strike me as different in kind from other kinds of language uses. Speakers shift linguistic register all the time without conscious thought. One register is used to talk to professors, another for friends, another for close family, another for one’s grandparents. Linguistic register is the variety of language a speaker uses in a given situation. For example, one would not use the same kind of language to talk to one’s grandmother as to your friends. One avoids the use of slang and vulgar language in an academic setting, and the language used in a formal presentation is not the language used in conversation. This is not just a phenomenon in English, of course; in languages like Japanese there are special verbs only used in honorific or humble situations and different structures which can increase or decrease the politeness of a sentence to suit any situation. This sort of shift takes place effortlessly most of the time, but relatively new forms of communication such as Twitter and other social media sites may be blocking this process somehow. In response to informal claims that the current generation’s language is negatively affected by modern communication tools likeTwitter, Mark Liberman undertook a brief analysis comparing the inaugural addresses of various Presidents. This analysis can be found on University of Pennsylvania‘s popular linguistics blog “Language Log”. Remarkably, he found a significant trend of shortening sentence and word lengths over the last 200 years. My research, while not addressing this directly, will demonstrate whether using these services affects a user’s ability to shift linguistic registers to match the situation as they would normally be expected to. Fascinating question in and of itself. I think on some level I’ve always been deeply aware of these kinds of shifts. As I kid when my parents were missionaries in New Guinea, I would speak with an Aussie accent while I was with kids at the school across the valley, which shifting back in to my Okie brogue on the mission field and in my house. And as I made my way in to academe my southern and southwesternisms gradually dropped away with a very few exceptions–aware as I was that my accent somehow did not signal intelligence and accomplishment. Mockery of southern white speech remains a last bastion of prejudice in the academy generally. I don’t think these are the kinds of register shifts Janis is looking at, but same territory. I’m also more interested in the general motive questions. If we could prove that Twitter inhibited the ability to shift registers, would that count as destroying or damaging the language in some sense? If we could demonstrate that Twitter was leading people to use shorter and shorter sentences–or to be less and less able to comprehend sentences longer than 160 characters. Would this signal an erosion in the language. We must have some notion that language can be used in more effective and less effective ways since we are all very aware that communication can fail abysmally or succeed beyond our hopes, and usually ends up somewhere in-between. Does the restricted nature of Twitter limit or disable some forms of effective communication, while simultaneously enabling others. These are interesting questions. I’m sure more intelligent people than I am are working on them. This entry was posted in cultural literacy, Digital Humanities, education, higher education, Humanities, literacy, teaching, technology, writing and tagged NITLE, twitter, undergraduate research on April 28, 2012 by Peter Kerry Powers. Yesterday afternoon at 3:00 about 30 Messiah College humanities faculty and undergraduates gathered to listen in on and virtually participate in the NITLE Seminar focusing on Undergraduates Collaborating in Digital Humanities Research. A number of our faculty and students were tweeting the event, and a Storify version with our contributions can be found here.I am amazed and gratified to have such a showing late on a Friday afternoon. Students and faculty alike were engaged and interested by the possibilities they saw being pursued in undergraduate programs across the country, and our own conversation afterwards extended for more than a half hour beyond the seminar itself. Although most of us freely admit that we are only at the beginning and feeling our way, there was a broad agreement that undergraduate research and participation in Digital Humanities work was something we needed to keep pushing on. Undergraduates are scholars, not scholars in waiting. If original scholarship is defined as increasing the fund of human knowledge, discovering and categorizing and interpreting data that helps us better understand human events and artifacts, developing tools that can be employed by other scholars who can explore and confirm or disconfirm or further your findings, these young people are scholars by any definition. Digital Humanities research extends (and, to be sure, modifies) our traditional ways of doing humanities work; it does not oppose it. None of these young scholars felt inordinate tensions between their traditional humanities training and their digital humanities research. A student who reviewed a database of 1000 Russian folks tales extended and modified her understanding arrived at by the close reading of a dozen. Digital Humanities tools enable closer reading and better contextual understanding of the poet Agha Shahid Ali, rather than pushing students away in to extraneous material. Many or most of these students learned their tools as they went along, within the context of what they were trying to achieve. I was especially fascinated that a couple of the students had had no exposure to Digital Humanities work prior to their honors projects, and they learned the coding and digital savvy they needed as they went along. Learning tools within the context of how they are needed seems to make more and more sense to me. You would not teach a person how to use a hammer simply by giving them a board and nails, at least not if you don’t want them to get bored. Rather, give them something to build, and show or have them figure out how the hammer and nails will help them get there. I’m looking forward to the Places We’ll Go. This entry was posted in creativity, Digital Humanities, higher education, Humanities, imagination, liberal arts, literature, poetry, teaching, technology, undergraduate research, writing and tagged digital humanities, Messiah College, NITLE, scholarship, undergraduate research on April 28, 2012 by Peter Kerry Powers. This afternoon the School of the Humanities at Messiah College will be connecting to the NITLE Symposium on Undergraduate work in the digital Humanities. Messiah College is currently considering making the development of undergraduate research, and especially collaborative research between faculty and students, a central theme of our next strategic plan. Like many colleges and universities across the country, we are seeing undergraduate research as a way of deepening student learning outcomes and engagement with their education, while also providing more and better skills for life after college. This afternoon, the School of the Humanities here at Messiah College is going to consider some more whether and how Digital Humanities might be applicable to our situation by participating in the NITLE symposium on this topic at 3:00. This entry was posted in Digital Humanities, education, higher education, Humanities, liberal arts, teaching, technology, Uncategorized and tagged digital humanities, humanities, Messiah College, NITLE, RE:Humanities, Swarthmore, undergraduate research on April 27, 2012 by Peter Kerry Powers. As professors we often make the mistake of asking each other in the hallway whether we are getting time “for our own work,” as if whatever it is that we are doing everyday in class and in our offices is not our own work but some alien thing forced upon us that belongs to others. 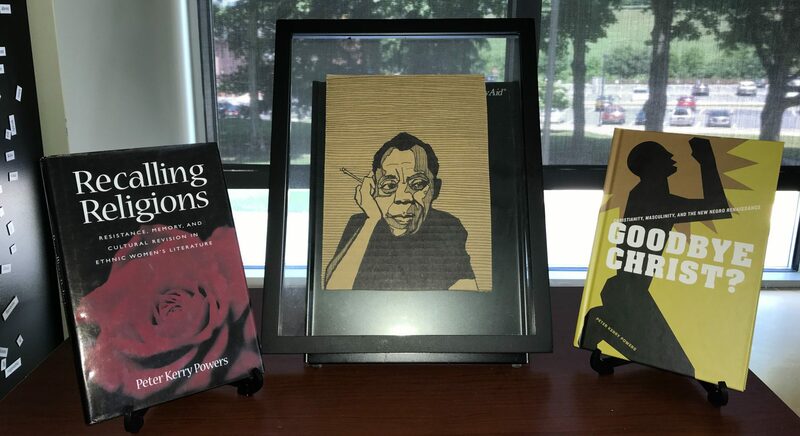 Our identities get wrapped in the books we’ve written or fantasized about, or the books we’d like to read, and we forget that our real work is the minds and hearts of the human beings in front of us every day. I’ve been really blessed with some amazing students over the years, and it is especially gratifying to me this week to be seeing so many of them doing so well, and getting notice for their achievements. A brief sample. Q. What kind of thing would you like to do but have no idea how to accomplish it? What would it be like, and what would people say about it? The only people for me are the mad ones--Liz Laribee, commissioned for Colin Powers. diverse ways, I have seen that act as breeding ground for a changed sociology. As a member of the artistic community here, I find myself surrounded by truly innovative, collaborative people who are committed to bettering this reality. More than anything I’d like to help give Harrisburg a process to funnel its energy into innovation and collaboration: an incubator for the culture being formed in its basement studios. This is the best town on the planet, and I would like to see us live up to our potential. I would love to find a way to help Harrisburg tell a story worthy of its citizens. via Harrisburg Magazine : Recovering/Uncovering: the Art of Liz Laribee. The poignant story of a Japanese American woman’s journey through one of the most shameful chapters in American history. Sipping tea by the fire, preparing sushi for the family, or indulgently listening to her husband tell the same story for the hundredth time, Kimi Grant’s grandmother, Obaachan, was a missing link to Kimi’s Japanese heritage, something she had had a mixed relationship with all her life. Growing up in rural Pennsylvania, all Kimi ever wanted to do was fit in, spurning traditional Japanese cuisine and her grandfather’s attempts to teach her the language. But there was one part of Obaachan’s life that had fascinated and haunted Kimi ever since the age of eleven—her gentle yet proud Obaachan had once been a prisoner, along with 112,000 Japanese Americans, for more than five years of her life. Obaachan never spoke of those years, and Kimi’s own mother only spoke of it in whispers. It was a source of haji, or shame. But what had really happened to Obaachan, then a young woman, and the thousands of other men, women, and children like her? Obaachan would meet her husband in the camps and watch her mother die there, too. From the turmoil, racism, and paranoia that sprang up after the bombing of Pearl Harbor and the terrifying train ride to Heart Mountain, to the false promise of V-J Day, Silver Like Dust captures a vital chapter of the Japanese American experience through the journey of one remarkable woman. Her story is one of thousands, yet is a powerful testament to the enduring bonds of family and an unusual look at the American dream. I was lucky enough to have Kimi as an advisee and am thrilled to read her book over the next few days. And these are only two. I think of Carmen McCain, writing so courageously and passionately in Nigeria. Of Debbie DeGeorge who had another play produced this past year. Both of whom I was lucky enough to work with on honors projects in their senior year. Of Janel Atlas, who has done so much for mothers who have experienced the loss of still birth. And Shawn Smucker, traveling across the country in a bus, his kids in tow. And Sarah Ginolfi, on her way to ordination. And Louie Marven. And Paul Gee, and Jonathan Scovner, and Jonathan Felton. And John Francis, traveling the world with guitar in hand. And Morgan Lee–whose honors projects on the politics of memoir I was honored to listen in on today. And Elena Casey, whose work I will hear on Monday. And on and on. And all the many, many, many others, too many to name, every one of them in their own way. This is our real work. When we forget that, we forget them, we forget ourselves. 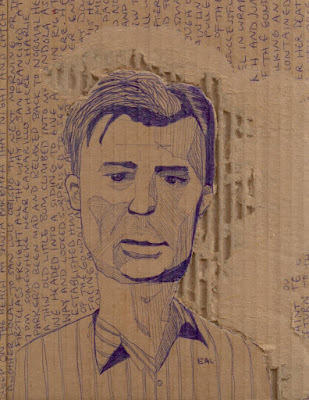 This entry was posted in education, higher education, Humanities, teaching, Uncategorized, writing and tagged Jack Kerouac, Kimi Grant Cunningham, Liz Laribee, students, teaching on April 26, 2012 by Peter Kerry Powers.